Many low-income families rely on wood heat because they can harvest it at very low cost and avoid the fossil fuel bills that cause the ‘heat or eat’ dilemma in many poor communities. Wood heat provides a means by which rural, low-income households can afford to heat their homes in the winter and can also stay off of public heating assistance programs such as LIHEAP. In Maryland, as in the rest of the US, rural families using wood avoid using more fossil fuel than all the Maryland families using wind, solar and geothermal combined. Based on US census and national trends, there are probably about a 242,000 Marylanders who use wood or pellets for heat. Another 594,000 Maryland homes have fireplaces. Of the 242,000 homes with stoves, 90% of that population uses wood as a secondary heat source and only about 10%, or 23,000, use it as a primary or sole heat source. Based on national trends, Marylanders burn about 400,000 – 500,000 cords of wood per year 75% of this is burned for heat in stoves and 25% in fireplaces or campgrounds. Typically, only 1/3 of firewood is purchased and the rest is self-harvested. Based on this national trend, Maryland businesses likely sell around $19 million by the cord, and $32 million is smaller packaged bundles. 1. Counties with per-capita income below the Federal Poverty Line have almost 3 times more wood heat users than counties above the Federal Poverty Line. To measure the disparity in wood use between high and low-income communities, we examined a total of 196 counties in six states; Oregon, Maine, New Hampshire, Montana, West Virginia and Maryland. The states selected were chosen for their geographical spread, high percentage of forest land and high levels of residential wood heat use; five of the chosen states are in the top ten highest wood use states. We analyzed the per capita income for each county to determine if families below the Federal Poverty Line (FPL) of $22,050 (for a family of four, 2009-2010) were more likely to use wood heat than families above the FPL. When the two groups were compared, we found that counties with a per capita income below $22,050 were 2.8 times more likely to have wood heat users than other counties (P=.001). Counties with a per capita income below the FPL had an average of 10.7% wood heat use as a primary or sole heat source compared to 3.8% in higher income counties. 2. Maryland counties show a 42% correlation between higher wood use and a higher percentage of families below the poverty line. We examined Maryland to determine the correlation between the percentage of families in a county living below the Federal Poverty Line and the percentage of wood use. Maryland is geographically well suited to take advantage of forest resources, and the counties have a wide range of incomes. Maryland counties have percentages of families living below the FPL ranging from 2.6%-13.3%. Analysis reveals a positive correlation between rising percentages of wood heat users and percentage of families in that county below the poverty line (Fig. 1). The predictable converse of this is visible in Figure 2. Counties with higher per-capita incomes are correlated with less wood heat use. Maryland’s counties reinforce the existence of a connection between families living below the Federal Poverty Line and wood heat use. This data suggests that low-income families consistently turn to wood heat as a heating source. Federal LIHEAP statistics indicate that while over 3% of low-income households are likely to use wood heat nationally, only 1.2% of LIHEAP recipients receive funding for wood heat. This could suggest a number of things including: qualified wood heat users don’t apply for LIHEAP assistance or despite being qualified for LIHEAP funds, wood heat users can afford to remain off public assistance. The Alliance for Green Heat is currently examining the LIHEAP programs in Maryland and West Virginia to further explore this question. Wood heat not only benefits the community by keeping heating dollars in the local economy, and benefits the state by potentially allowing LIHEAP eligible families to remain off heating assistance. It also may help the borderline LIHEAP eligible demographic save money and avoid becoming qualified for LIHEAP. The major drawback of wood heat is emissions. In most areas of the US, 65 – 80% of stoves used were made prior to 1988 when the EPA started regulating stoves for emissions. Those older stoves typically emit 30 – 40 grams of particulates per hour, and justifiably cause concern. Since 1990, the EPA has limited wood stoves to a maximum of 7.5 grams an hour. While technology and state regulation has advanced, EPA’s emission limits have stayed the same, rendering them somewhat irrelevant. Today, about a quarter of wood stoves produced are under 3 grams an hour. Pellet stoves have never been regulated by the EPA but states have provided some necessary regulation, and about a quarter or a third of pellet stoves today are under 1.5 grams per hour. Moreover, emissions from pellet stoves are consistent over time, unlike wood stoves that can vary depending on the moisture content of the wood and other factors. An incentive program is likely to steer most consumers to the eligible stoves, resulting in much cleaner stoves being sold and installed. Moreover, if combined with an additional rebate to turn in older, non-EPA compliant stoves, it gets those stoves out of circulation instead of onto the second hard market. Under the proposed legislation in Maryland, half the population that lives in more densely populated areas and heats with gas is only eligible for a rebate for a pellet or corn stove, not wood. That is likely to lead to people in densely inhabited areas installing low-emission pellet or corn stoves, instead of wood stoves. This too will lead to an improvement in air quality, if this program is adopted. This is based on national averages of each wood stove using an average of 1.5 cords per year and each fireplace using an average of .25 cords. It also conforms to US Forest Service estimates on wood usage per capita nationally. Based on national averages of how much wood is sold in bulk by the cord and sold in higher priced small packages in retail stores. Purpose: to establish a renewable energy grant program in Maryland for residential wood and pellet heating units. Unlike the current renewable energy grant programs for solar, wind and geothermal, this program is designed mainly for low and middle-income families. Unlike those programs, which can provide very large grants mainly to wealthy families, this would provide a maximum grant of $1,500 so that available funds can benefit many families. The program would establish the strictest emission limits on wood and pellet stoves in the United States. • Displaces expensive and carbon intensive heating fuels: oil, electricity and propane. • Keeps heating dollars in the U.S. and often in Maryland. • Provides jobs in rural communities. • Provides energy independence and security. • Provides more economic security for low-income families who would otherwise have to pay high-cost fossil fuel utility bills. • Drives customers to the cleanest stoves and thus avoids the installation of hundreds of dirtier models. Grant amount: 30 – 40% of purchase and installation price up to a maximum of $1,500 per family. Installation by a certified installer required. • Extra $250 for the trade in of a non-certified EPA stove. The installer and/or stove retailer is responsible for handling trade-ins. Rationale: This provides 1. larger grants for low-income families who most need it, 2. An incentive to choose the cleanest stoves on the market today, and 3. an additional incentive to get older, polluting stoves out of circulation instead of being sold on second hand market. Equipment eligibility: Pellet stoves that emit less than 1.5 grams per hour and wood stoves that emit under 3.0 grams per hour. Rationale: EPA currently allows up to 7.5 gr/hr for wood stoves and no upper limit for pellet stoves. The only other statewide limits are in Washington that allows up to 4.5 gr/hr and Oregon that allows up to 2.5 gr/hr for their tax incentive program. This would establish Maryland as a leader in promoting the cleanest stoves on the market today. Household eligibility: For woodstoves, families whose primary heat is electricity, oil or propane; for pellet stoves, any household in the state. Rationale: This would target 1. Families who have the most expensive heating systems, and 2. Rural families who do not live in densely inhabited areas and 3. Rural families who do not live in the air quality non-attainment zone that extends up and down the DC – Baltimore corridor . For Maryland Green Heat supporters wanting to write their delegates we have provided the following form letter. The most effective way to be heard by your Delegate is to personalize your message so feel free to use this to start but we highly recommend you add a personal touch. I am writing you to state my support for House Bill 829. This act, concerning the Renewable Energy for All Act (REAL) will make Maryland a leader in setting emissions standards for wood and pellet stoves while helping low-income families affordably heat their home from local fuel. In light of the proposed cuts to LIHEAP funding in the federal budget it is as important as ever that Maryland assists its most needy families. REAL and its grant program, which provides a 30% grant up to $1,500, is an excellent way to provide an affordable and clean heating solution to Maryland Households. Please stand up for families across Maryland and support H.B. 829. The Alliance for Green Heat has been working with partners in the Maryland House of Representatives to advance House Bill 829, an act concerning the Renewable Energy for All Act. Introduced by Representatives Mizeur, Miller, Bobo, Hucker, Luedtke and McMillan, it will establish a renewable energy grant program in Maryland for residential wood and pellet heating units. Unlike the current renewable energy grant programs for solar, wind and geothermal, this program is designed mainly for low and middle-income families. Unlike those programs, which can provide very large grants mainly to wealthy families, this would provide a maximum grant of $1,500 so that available funds can benefit many families. The program would establish the strictest emission limits on wood and pellet stoves in the United States. As the release of our 2011 Residential Wood Heat Report Card demonstrated, many states are lagging on their support for biomass at the very same time that its use as a heating fuel has been increasing. Maryland alone witnessed a 10% increase in the use of wood or pellet stoves, however many of these are older, polluting models, which can have dangerous health effects and are unnecessarily polluting. This bill will help those most in need make the switch to green heat. Join the fight! Contact your Representative today and tell them that they should support H.B. 829. Low-income families across Maryland stand to benefit from affordable heating fuel while everyone can appreciate cleaner air and less climate change causing emissions. Join the Alliance for Green Heat for a workshop on wood and pellet stove incentive programs and how they can best help the consumer, the industry and our environment. The Alliance has been working with policy makers, consumer groups, non-profits and industry to develop a tool-kit on options to incentivize residential wood heat. This toolkit, funded in part by the Forest Service, will not only provide a how-to explanation of wood heat incentive programs, but why policy makers should care. This session is your chance to get your voice heard on these issues. These presentations will cover selected incentive programs, highlight unique and interesting ones and give pointers on how to establish a program in your state or local area. Is policy shifting to performance-based incentive programs? What types of incentive programs work best? What were the pros and cons of the federal tax credit? How can the industry work with policy makers to the best interest of all? Assist low-income households to purchase an affordable heating source? Push the technology to become as clean as possible? Assist the industry to stimulate the economy and job growth? America's oldest heating source - firewood - is experiencing a comeback, with wood heat soaring 50% - 80% in the last decade in some states, but only a handful of states are prepared to leverage American's newfound enthusiasm for wood heat. A report released today, the "Residential Wood Heat Report Card," by the Alliance for Green Heat, finds that most states do little to promote and manage what is often the second or third most popular heating fuel in hundreds of rural counties around the US. Darker green indicates highest per-capita wood use. "Wood heat is overwhelmingly America's most common form of residential renewable energy, but states are just beginning to tap into its potential to drastically lower fossil fuel use while managing emissions," said John Ackerly, President of the Alliance for Green Heat. "Already, homes with wood and pellet stoves displace about 17 times more fossil fuel than homes that have solar panels. The states that tap into this potential of clean wood heat can create thousands of jobs, improve energy security and keep tens of millions of heat dollars in their own state," Ackerly noted. According to the US census, about a quarter million more Americans are heating primarily with wood than in 2000. In six states, Connecticut, Massachusetts, Michigan, New Jersey, Ohio and Wisconsin, the number of Americans heating with wood rose between 50 - 80%. The Alliance graded each state on six categories, including policies that help reduce wood smoke, promote the cleanest appliances and restrict the most polluting ones, and provide educational information on best wood heat practices. The states that got the top grades, such as California, Colorado, New Hampshire, Oregon and Washington are states that are often at the forefront of developing renewable energy, but are not necessarily the states with the highest per capita wood heat use. The top-scoring states were the ones who: 1. Restricted installations of more polluting wood appliances not certified by the EPA, 2. Provided Energy Star-like incentives for residents to buy the cleanest stoves, and 3. Provided extensive educational information on clean burning practices. New Hampshire provides a rebate of up to $6,000 for residents to buy an ultra-clean automated central pellet heat system, similar to the technology that is routinely incentivized in much of Europe. Pending legislation in Maryland would provide a pellet stove rebate for any resident and a wood stove rebate for rural residents whose primary heat is oil, electric or propane. Arizona provides a $500 tax deduction to install an EPA certified wood stove in a fireplace, preventing excessive pollution from traditional fireplaces. California and Washington are the only states that require new stoves to be EPA certified, whereas the other 48 states allow cheap, unregulated stoves (often made in China) to compete against clean EPA regulated stoves made in America. Oregon requires old uncertified wood stoves to be removed and destroyed upon sale of a home. The Report Card sheds new light on a very old form of renewable energy that is still used by millions of Americans. The EPA estimates there are about 12 million wood stoves compared to only 300,000 solar photovoltaic systems in homes in the US. "This country can achieve renewable energy and energy independence goals significantly faster and cheaper by deploying modern thermal biomass systems," said Mr. Ackerly. American stove manufactures produce some of the cleanest stoves in the world, up to 90% cleaner than EPA requirements, but most Americans are still using older, polluting models. Pellet stoves, invented in Washington State, are exceptionally clean but America has done little to incentivize them while Europe has produced tens of thousands of jobs in the pellet sector. Darkest green indicates largest increase in wood use, white indicates no change, while darkest blue indicates largest decrease in wood use. The full report explains the project and has state by state explanations of the programs (or lack thereof) that lead to the State's grade. 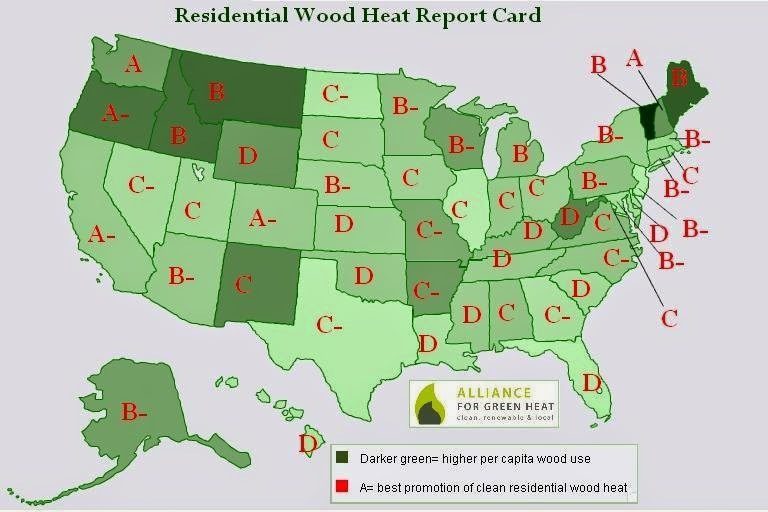 This document provides helpful background information on the Alliance for Green Heat and residential wood heat in the US. This fact sheet provides state specific data on wood as a primary heating source in 2000 and 2009.